PROLOGUE: Like Kal-El, who came to Earth endowed with super powers from the planet Krypton, and who disguised himself as a mild-mannered reporter, your Curmudgeon came from a far away website, where he too developed extra-ordinary powers. Resolved to use his abilities for the benefit of all mankind, he assumed the identity of a Sensuous Curmudgeon and started this humble blog two years ago. The date was 02 April 2008. The adventure had begun. Many other blogs are devoted to The Controversy between evolution and creationism, but ours is different in several ways. We operate from the fabled CITADEL — the Curmudgeonly Institute for Tactics, Advocacy, and Defense of the Enlightenment Legacy — the secret global nerve center for monitoring events throughout the Creosphere, where your Curmudgeon is headquartered in his luxurious underground control room. Underlying everything we do here is our commitment to the values of the Enlightenment, which were responsible for the American Revolution, Constitution, and Bill of Rights — without which the world would be a very different place (see Salem and Philadelphia: A Tale of Two Cities). That commitment fuels our opposition to the creationists (see Enemies of the Enlightenment). That is why we don’t merely search for headlines mentioning “evolution,” and then post that Dr. X says Darwin’s theory is good science, or Dr. Y describes beetle courtship displays (unless X or Y is Olivia Judson.) We don’t intend to be yet another aggregator of evolution news. Instead, we choose subjects that fit our very specific purpose. We are constantly aware of the creationists’ long-range goals (see Intelligent Design: It’s Not About Science). We know that their campaign to teach “both sides” of the non-existent “controversy,” allegedly in the interest of fairness and academic freedom, is only the tip of their wedge strategy. The posts we like best are those we write about creationist organizations and their motives. To the extent possible, we explore their finances (see Discovery Institute: Their 2007 Tax Return), their tactics (see Discovery Institute Tactics: Recruitment), and their strategy (see Intelligence Briefing: The State of the Creosphere). That “briefing” post was only partly a spoof, being loosely modeled on a National Security Counsel memorandum; but we see The Controversy as a deadly serious philosophical war with significant consequences for the future of Western Civilization, and we treat it as such. We also like to focus on creationist legislation and litigation. We’re not alone in that, of course, but we bring our own approach to it (e.g., see The Curmudgeon’s Amendment, and then “Academic Freedom Act” — Presumptively Void, and also this The Goal of the “Darwin’s Dilemma” Lawsuit). When we venture into politics — which is inevitable given the way creationism is being promoted — it’s obvious that your Curmudgeon is an old-style Republican from the constitutional, limited government, free-market days before the “social conservatives” came to prominence (see Open Letter to the Republican Party). Most other science-oriented blogs tend toward the left end of the political spectrum. We’re here to balance things out — and to confound those creationists who claim that evolution is a left-wing conspiracy. Our hope is that one day the Republican party will once again be a rational alternative to the Democrats, but it’s been badly compromised (see Creationism and American Politics), and we’re not optimistic (see America’s Future: The Worst Possible Scenario). Unlike some other blogs that defend evolution, we neither belittle religion nor promote atheism. Indeed, we don’t oppose religion at all. But creationism is another matter — it’s literally reality denial. Even so, although it’s a deplorable affliction, it’s a personal choice and shouldn’t bother the rest of us. But creationists too often advocate theocracy, seeking to suppress science and impose their beliefs on others. That is what we oppose. As with our politics, this too is confusing to creationists, who simple-mindedly equate creationism with religion. They seem oblivious to the fact that several major denominations are wise enough to avoid being anti-science. Our attitude about religion was manifest in the debate which briefly raged on science blogs between the religion confrontationalists and the religion accommodationalists. We adopted our own approach — indifference (see Religion and Evolution: Part III). We prefer to let pro-science and anti-science denominations argue among themselves. Sectarian science-denial, regardless of its sincerity and intensity, is not a scientific weakness or controversy — it is absolutely irrelevant to science. Therefore, we choose to remain aloof. Our existence negates the fantasies of creationists who mindlessly crusade against “Darwinism” in the mistaken belief that evolution is a cunning plot for promoting left-wing politics and atheism. Not knowing what to make of us, they ignore us — as they ignore all inconvenient evidence. Yet here we are. Somewhat paradoxically, we don’t dwell on scientific minutiae. No one comes here to read about sequencing DNA. One of our principal activities is shredding the arguments of creationists, which is not a science-heavy task. It requires science literacy, of course, but beyond that it requires a willingness to read the claims of creationists, identify their premises, analyze their arguments, understand their errors, and then lucidly describe the results. We think that’s one of our specialties; e.g., see Debating Creationists: The Big Lie, and also Retrospective Astonishment, and then Inductophobia). From there, refutation a simple matter. Creationist arguments are also easily spoofed, sometimes by doing little more than restating them clearly, and we delight in doing so. See, for example: The Ten Laws of Creationism, and then Template for Anti-Science Activism, and also Two Plus Two Equals Three. Although debating creationists is a popular feature of many blogs on this subject, we don’t engage in that. We deal with the creationists’ arguments, of course, but those haven’t substantially changed for a hundred years, and we don’t need the proponents of such nonsense to be here, threatening everyone with hellfire while repeating canards that were debunked long ago. The participation of creationists is almost always disruptive, and the raucous exchange of insults which inevitably ensues is an ugly, unproductive pastime. We won’t allow it. Because we’ve seen the dark side of The Controversy, we were determined from the beginning to run this blog as a respectable operation, with no abusive language, no outrageous commentary, and no personal feuds. We know that a few of our essays have been assigned reading for college-level courses — these, for example: Where Are The Anachronistic Fossils?, and also Advice for Creationists. That might not happen were it not for our civility standards. We regularly ridicule the woeful ramblings of solitary creationists who write letters-to-the-editor, and we also visit a few of the popular creationist websites to discuss their peculiar essays, but that’s mostly for amusement on slow news days. It can sometimes be useful to see what those people think — but only if they’re politicians or political activists. What will we be writing about in the future? That’s difficult to say. There’s no shortage of suitable news when The Controversy pot is boiling, as has happened during the political conflicts in Florida, Louisiana, and Texas. But there are days when it’s not easy to find good material, especially considering all the things we’ve decided not to post about. Our deliberately narrow focus explains why we so often go dumpster diving at creationist websites. But it seems to work, allowing us to balance our serious posts with others more lighthearted. EPILOGUE: So ends our self-indulgent retrospective, which is also a belated manifesto. After two years and more than 1,400 posts (about 2 per day) we’re still blogging away. Are we making any progress? Perhaps not, but we have a lot of visitors, we receive intelligent comments, and our view of things is getting out there, making the rounds in ways we may never know. As long as The Controversy continues, so will we. Congratulations on your anniversary. You have carved your own slice in the evo-creationist battle and it is always a pleasure to read your blog. Keep up the good work in the good fight. Happy Birthday, eh, Blogday, oh just Congrats. Kudos for your effort over the last two years. Someone has to same Western Civilization, right! Or Mork from Ork. 😉 Congrats either way! Thanks for fighting the good fight! I envy your talent and energy, and we’re grateful you’re using your power for good. Happy B-day, Curdge. Any significance to it being the day after you placed the beginning of The Flood? Any significance to it being the day after you placed the beginning of The Flood? Yes! The 2nd day of the month follows immediately after the first. After two years and more than 1,400 posts (about 2 per day) we’re still blogging away. Prolific little devil, aren’t you? Congrats on the anniversary; stay the course! Congratulations! Please be sure to come up out of your luxurious underground control room long enough to get enough sun to maintain beneficial vitamin D levels. You could always work on your laptop out on the patio. Felicitations and many thanks from this grateful reader. You have done splendid work with your blog, and long may you continue! We know that a few of our essays have been assigned reading for college-level courses…. Happy to be fighting alongside you, chief. A worthy adversary for the neo-theocrat crowd. Good job. A curmudgeon with style is such a rarity but you fill in this gap nicely. Love your blog, SC. You keep writing and I’ll keep reading and fame and fortune shall surely follow you all the days of your life. Now if only they’d quit dawdling and catch up already! There’s not much to tell. Some professors have websites where they list reading assignments for their classes. On rare occasions one or two of my posts get assigned, and linked. If I hadn’t disabled “trackbacks” (because they are sometimes used for spam) those links would probably show up in the comments section of the assigned posts. It’s only if I check on where hits are coming from that I’ll find out about it. I discovered this blog just a few weeks ago. It is always a good read, and the difference to the other blogs where the “controversy” is a main theme (from whichever perspective) is refreshing. Keep up the good work guys. 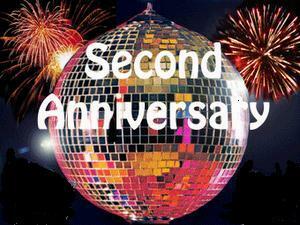 Congrats on your second anniversary.